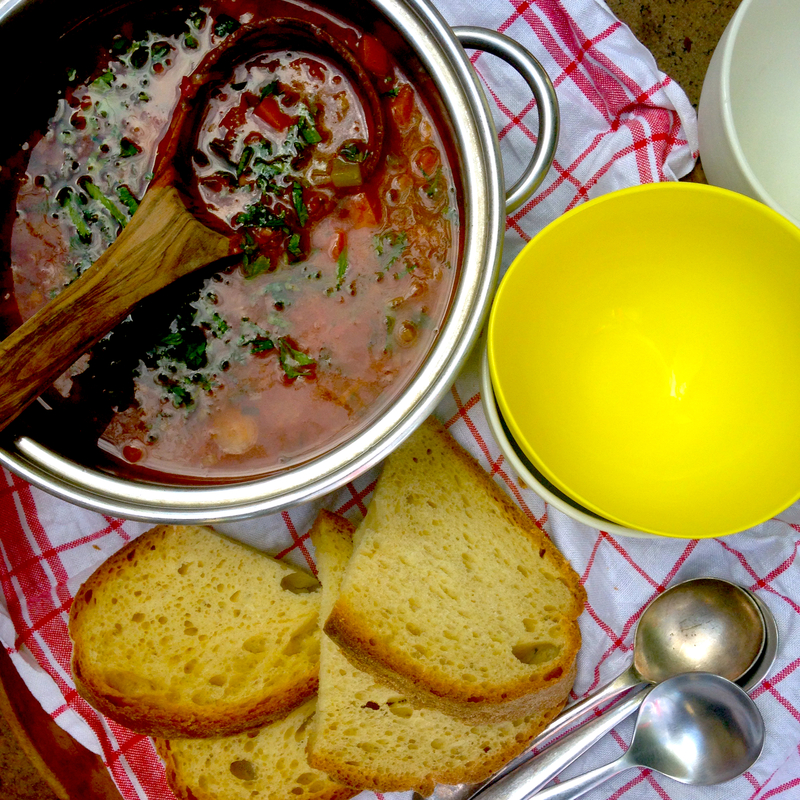 This soup from Jill Dupleix is life saving for a number of reasons. It makes a delicious, economical one pot family meal, with ingredients you’re likely to have on hand (requiring no last-minute dash to the shops). It’s even better the next day, so you can make several meals out of it. Although it takes a while to simmer away on the stove, it’s so simple to bring together, you can make it when exhausted and half brain-dead. Plus lentils – they’re good for you – the cholesterol eating Pac Men of the nutritional world! I’m rejoicing in the last of the cool weather before the heat hits. Eating soup and living easy. This soup is good, make a big pot of it, the life you save may not just be your own. Heat oil in a large saucepan and saute leek, carrot and celery for 4-5 minutes. Add the tomato paste and saute for another minute. Add the lentils and stock, bring to the boil and simmer gently, skimming the surface of the soup occasionally, for about an hour or until lentils are tender. Add chopped tomatoes, cannellini or chickpeas, coriander, paprika and salt and pepper to taste. Simmer for a further 20 minutes until soup is thick. Check for spices and seasoning and stir in half the parsley. Serve with crusty bread with extra parsley and olive oil sprinkled on top. The soup looking so delicious..
Made this two nights ago — it’s a big hit!